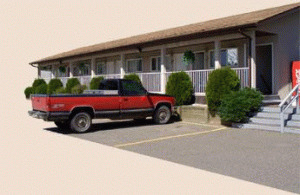 The North Country Inn Restaurant and Motel is a family run business, established in 1984. We are located in the beautiful Nechako Valley of British Columbia, Canada. Vanderhoof, BC is the geographical center of British Columbia. 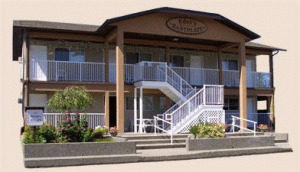 We are conveniently located on Vanderhoof's Burrard Avenue. Our rooms are quietly located in the back of the large property. From here everything in the downtown core is within walking distance: shopping, playground, walking trails, schools, dental office, etc. We are about 100 km west of Prince George. Vanderhoof, BC has many attractions, especially for the avid outdoorsman. Close to Vanderhoof, BC are many lakes with great fishing. How about goose hunting in the fields surrounding Vanderhoof, BC? Or hunting for larger game, such as bear, elk, deer, or moose? To satisfy your hunger after a busy day, try our wonderful cuisine at the North Country Inn Restaurant. We feature German and Canadian cuisine and offer great family dining in a cozy log-house atmosphere. There is an amazing fireplace in the Restaurant, great for cold days to sit close to, and many great displays on the walls, showing off many animal trophies and other interesting memorabilia. Please visit North Country Inn Website.